I’ve discovered a lost world just this week. And I mean that. I’m not talking in hyperbole. 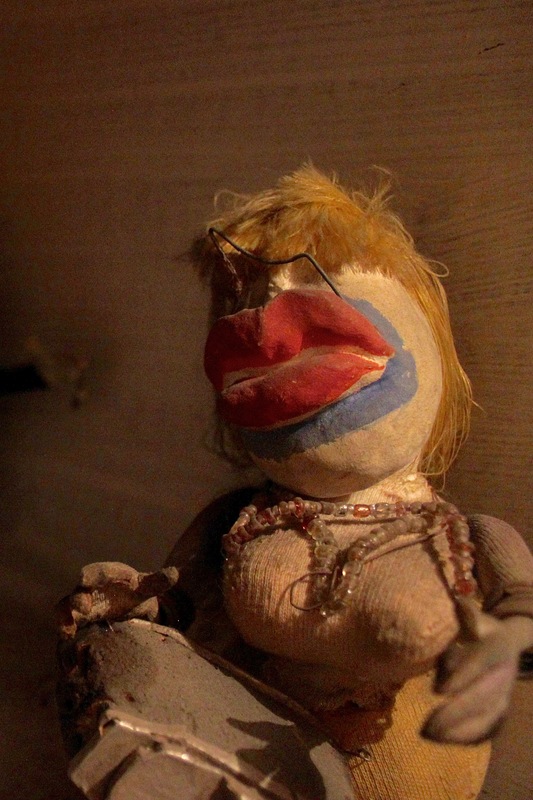 I was ushered into a room that had the puppetry equivalent of King Tut’s treasures in it. Collecting the dust of years. 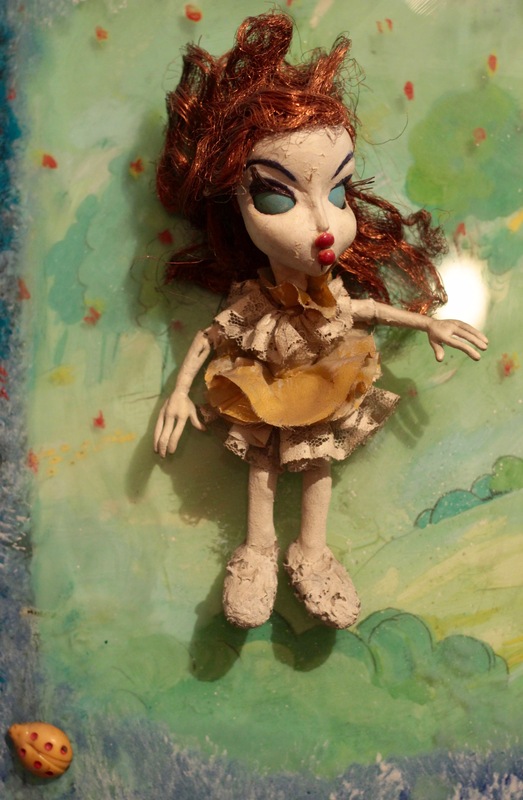 Made by a name seemingly opaque to the world of puppets, puppet films, puppetry animation, never mind the big world. More than once my jaw was firmly resting on the floor with the miniature spectacle being revealed to me. 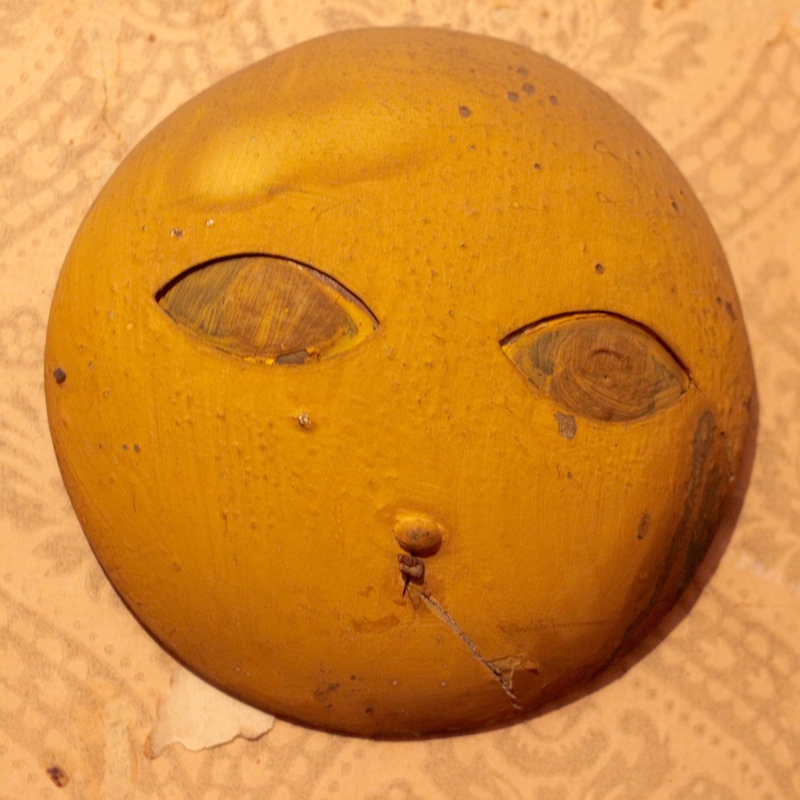 I found a lost world this week, the world of forgotten Georgian puppet animator Karlo Sulakauri. I originally visited Tbilisi Georgia in March of 2016. One of the tiny museums I tried to get into was what the Georgian Museums site called the Animated Puppet Museum. I had dutifully, eagerly hunted it down, going so far as to navigate the cryptic bus system to end up at 23 Amagleba Street. All I found was a locked door, the most paint cracked door imaginable, with an old rusty plaque on it that read ‘Karlo Sulakaure – Puppetton (?) Animation Doll Museum’. A ringing of the bell and knocks on the door produced no sound. Trying to peer into the windows proved impossible. The other puppet folk in Tbilisi didn’t even know of the existence of this place. I wrote to the email addresses listed on the Georgian Museums page. Silence. Back at the mysterious door 2018. I wrote a note to the Quay brothers about it. They immediately saw the extreme possibility of what might lay behind that door. 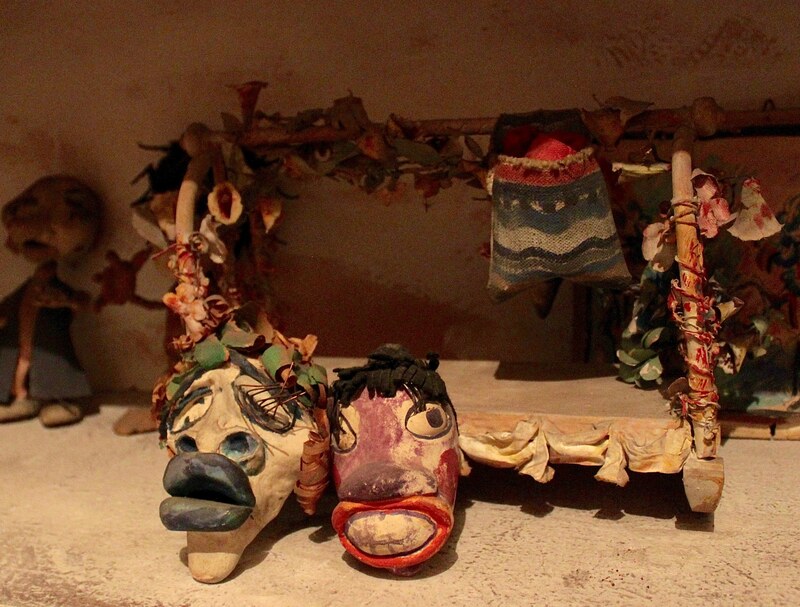 They wrote back: “The plaque of the Puppet Museum is very moving and poignant. Somebody probably walked out, locked up, and then passed away and that person had the only key and he/she was buried with it, and the museum as well. But you must try to get into it.” I took that as a command. But to no avail. Like the spectral house in Shirley Jackson’s Daemon Lover, no one ever came to the door. Whenever I mentioned it to people who might know something they just looked at me with a puzzled hopeless expression. And so I left Tbilisi and all I had was the mysterious plaque in a photograph. Sulakauri’s studies of facial expressions. I arrived back in Tbilisi in late December of 2017 for an extended three month stay. I would meet more people. Occasionally I asked about the museum. No one knew anything. Then at the beginning of February, reflecting on the older photo, I thought again about the museum and then remembered the Quays command. I thought let’s give it one more try. So I wrote to the email addresses still listed on the museum website. Sulakauri’s posters for his puppet troupe. And then I received a response from someone named Daro Sulakauri. Originally I thought it was a man, but it is hard to tell male and female names apart in Georgian. Tako is girl. Toko is a boy. Daro proved to be the granddaughter of Karlo Sulakauri, who had made animated films from the 1950s until the 1980s in the old Soviet Union. The little museum featured his work exclusively. 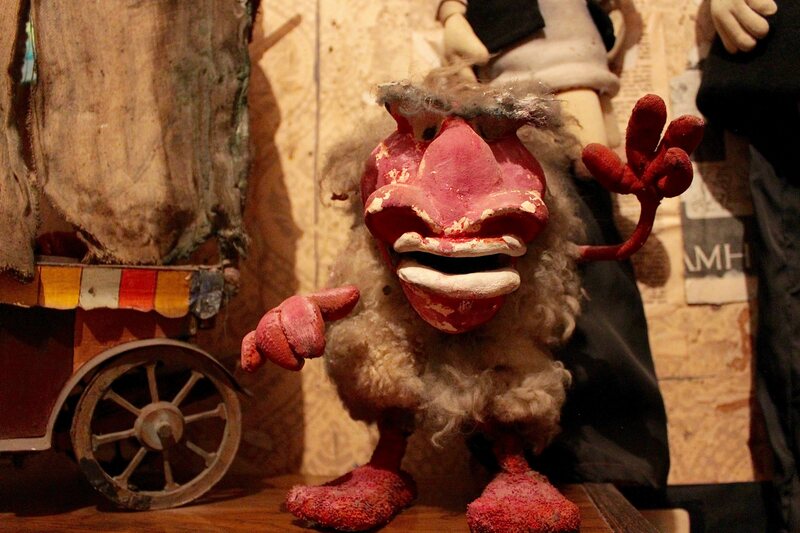 Daro would be happy to open the door to the ‘Puppetton Animation Doll Museum’ and to give me a private showing. I had no idea what to expect. But it would take longer than I expected to get in. Daro is a photojournalist who works for international magazines like National Geographic or Georgian Journal, etc and she was often out on assignment. I had to wait. But what else is new? This is Georgia. I’m getting used to it. Eventually Daro’s schedule proved favorable to a visit. And so I took the bus up to Amagleba Street and stood again at the decaying door. I pressed the doorbell. No answer. But I assumed that she would be coming from somewhere else. I was wrong though. Shortly before the appointed time a pleasant curly haired young woman wearing glasses opened the door with a friendly smile. She didn’t know I was there. The doorbell didn’t work. I should have knocked. One of the walls in Sulakauri’s museum. But as I stepped in I was suddenly presented with a very tactile colorful artistic stairway leading up to the first floor. But we stepped under it and back passed piles of stored boxes and other debris. Daro opened up a door and flipped a light switch. I was sidetracked by some art on the wall. And then I turned my attention to the room. And as we entered I must have gasped. I had expected some children’s puppetry. It turned out that Elene at Budrugana Gagra did know about this place. In fact they used to practice underneath in the basement, in what is now a restaurant. (This happens all the time here. Someone says they don’t know what you mean. Then it turns out they know much more than they said.) Elene had shown me a couple of pages in a book on Georgian animation. A thick book! And it seemed like pleasant work. But none of those images prepared me for what I was about to discover. Karlo Sulakauri wasn’t just an animator, he was an artist with a complete aesthetic vision. And no one seemed to know anything about him. More figures with strange lips. But Daro knew a lot. We spoke as she pointed things out. I waited a moment before beginning to photograph the collection. I was just trying to take it all in. Once my eyes adjusted I began to see images of creatures and people that I had never seen before. There was an old man in a wagon. I saw strange assemblages on the wall made many years ago that looked like they could have been found in a Soho gallery today. There were strange figures with even stranger lips. A tree man, I think, made of of wood. Look again and that old man had a strange grin. There were old posters of puppet shows from the mid-20th Century. Photos of Karlo and his film crew. Deformed asymmetrical puppets. A wicker figure. 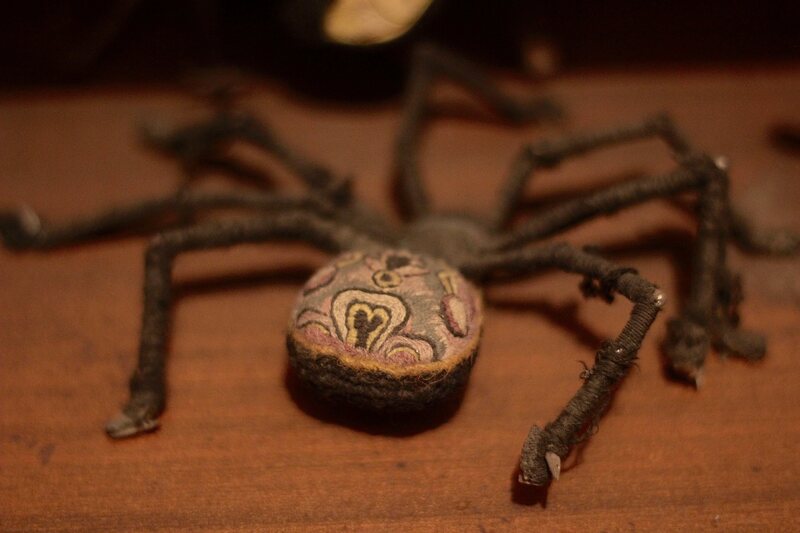 A large spider with a weird painted abdomen. A wooden flute with insectoid notes emerging from it. And most impressively, even eerily, of all I was struck by an insect/bird/moth/fairy that was battered with age and set against a ragged aquamarine background. And as I spoke with Daro fragments of Karlo’s life began to revealed. And I soon recognized an absolutely dramatic story in the telling. And later I would hear even more of the tale from Daro’s father, Karlo’s son, Dato. Meanwhile I began to discuss even more with Daro, which eventually settled upon the topic near and dear to many Georgians – music. Then Daro introduced me to her husband, an electronic DJ, Giorgi Kancheli. And soon we were sitting in his studio listening to music and discussing the vinyl LP, of which he had a respectable collection. And I realized that there was something in the way Georgians talk that is at once open to new ideas, yet simultaneously respectful of traditions. Meanwhile I was smitten by the art all over the house. Much was by Dato. One wall tapestry arrested me for its use of textures. 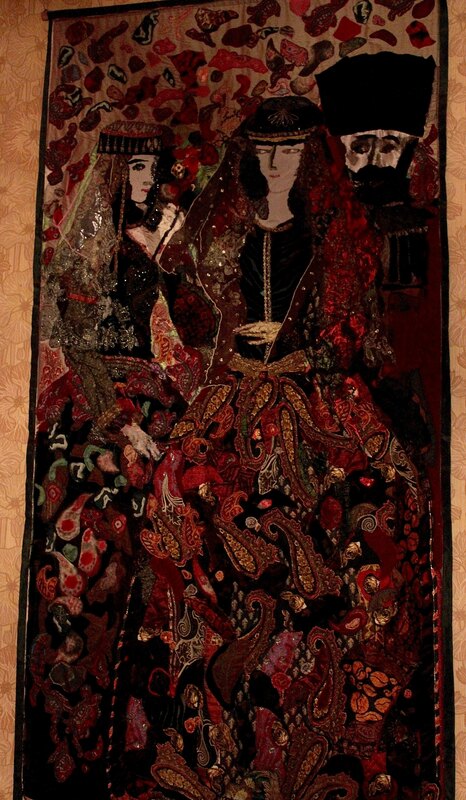 This was made by Daro’s mother, Nino Kipshidze. 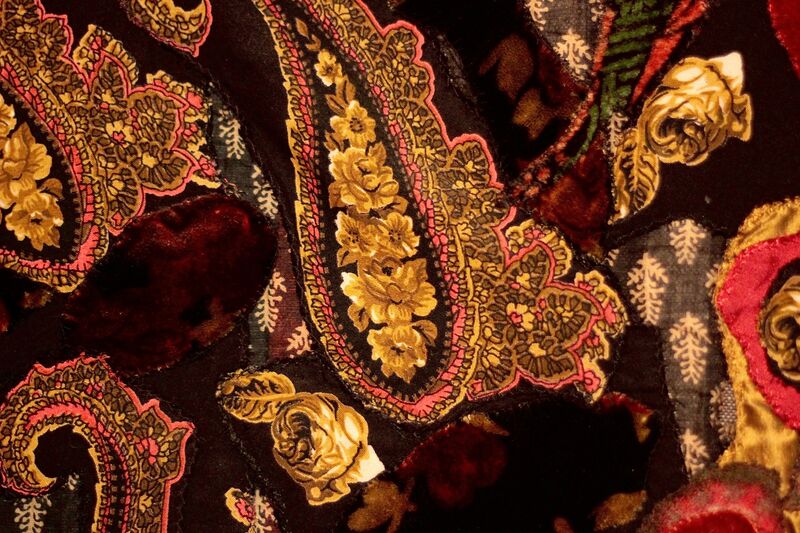 Then Daro pointed out a portrait of her mother in her youth as drawn by the famous Soviet Era filmmaker, Tbilisi born Armenian, Sergei Parajanov. In fact the creativity of this lineage of human beings was quite something to behold. And soon I would see just how much more there was. Daro drove us through the back streets of Tbilisi until we arrived at a building not too far from Rustaveli Square, yet complete hidden. A gently aging ornate wooden house similar in color to the paint behind the moth fairy. We were met at the door by Dato Sulakauri, who it turns out is a very respected painter in his own right, and his wife Nino Kipshidze, who actually runs the Georgian State Museum of Folk and Applied Art that I described in my last essay, and does fantastic patchwork art of her own in tapestries, based on traditional Georgian motifs. And the part of me that is desperate for texture really connected to one of her works back at the museum / Daro’s house. But it was Dato’s work here that caught me. 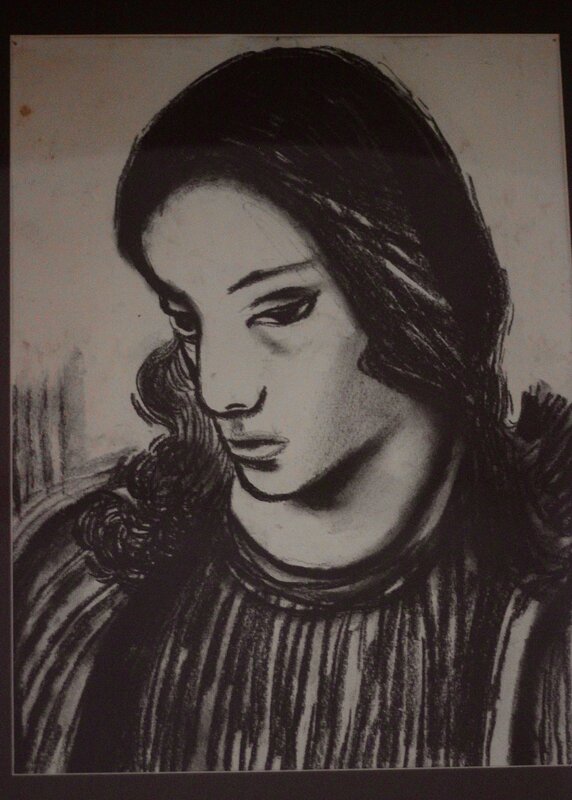 His work too was often inspired by Georgian themes. And his encaustic (waxed based) ikons were beautifully rendered, being both primitive (you could see ancient Roman art in his paintings), contemporary (technique, style, intensity) and yet there was gratefully no trace of postmodern irony. I was so impressed that Dato noticed and eventually handed me a copy of a book of his work. One of my favorite Dato paintings. One feels the ancient Roman eyes staring at you. Dato Sulakauri and his Ikons. But I was here to discuss his father, Karlo. But not until Nino laid a small but wonderful table setting of wine, tea, cookies and jam. Eventually it was time to set up the camera and train the lens on Dato, who then through Daro, an excellent interpreter due her time spent in the USA. (But that’s a long story better left for another time.) Then came the story of Karlo Sulakauri, which touched me in its complexity, heartbreak, drama and epiphany. How can I possibly do it justice? Perhaps a few details. But that’s only the beginning of the issues surrounding these films. The Soviet apparatchik producers were playing a strange game with the puppets, which involved destroying the figures in front of Sulakauri at the end of production in order to embezzle the money needed to produce more puppets. Sulakauri was able to smuggle out duplicates of many of the puppets. But many precious originals were cut in half before his eyes. And then there was a fire that swept through the Tbilisi studio. 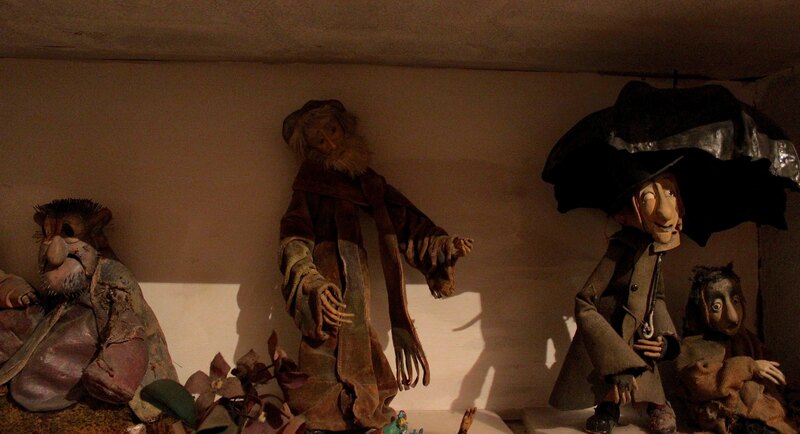 Sulakauri actually risked his life to rescue the puppets that now live in this museum. There were strange issues with the censors. Sulakauri would put in ambiguous images like a red Kremlin shaped building that was filled with clowns. Hmmm. What kind of symbolism could that contain? When asked, he waved away their correct suspicions by saying it was just the clown house. They made him paint it white. But the point was still being made. In another episode Sulakauri put a subliminal image of St. George. But they caught it when they happened to freeze frame the film accidentally in that exact spot. After the end of the Soviet Empire, in the early 90s, when Georgia was independent but caught in an internal civil war, fighting spread to the streets on Rustaveli Avenue. Sulakauri watched on helplessly. The main body of his work was finished. Yet he was inspired to make a new piece. He worked on it for over a year. He wanted the strife to end. This was to be his masterpiece. When it was finished he took it to be developed. As it was running through the developing machine the electricity suddenly failed, as happened often in Georgia in the 90s. The entire film was ruined. Sulakauri was devastated. He gave up on filmmaking, never to make another film. His depression was serious. It was the birth of his grandchildren that brought joy to his final days. He died in the year 2000. The Sun? Or just a block of Wood? And so his collection has remained pretty much where he left it ever since then. Collecting dust. Awaiting rediscovery. This small museum was occasionally open. But not for some time. And it was his granddaughter Daro, now living in that house, who opened the door for me to see these treasures. I told her that I was absolutely stunned and honored to be able to see these things. I also told her that puppet animation history needs to be rewritten to include Karlo Sulakauri. My time with the Sulakauris was deeply moving on many levels. And I felt grateful to be allowed a step into their world. When I arrived at my apartment on Vazha-Pshavela Avenue I did a little online homework. 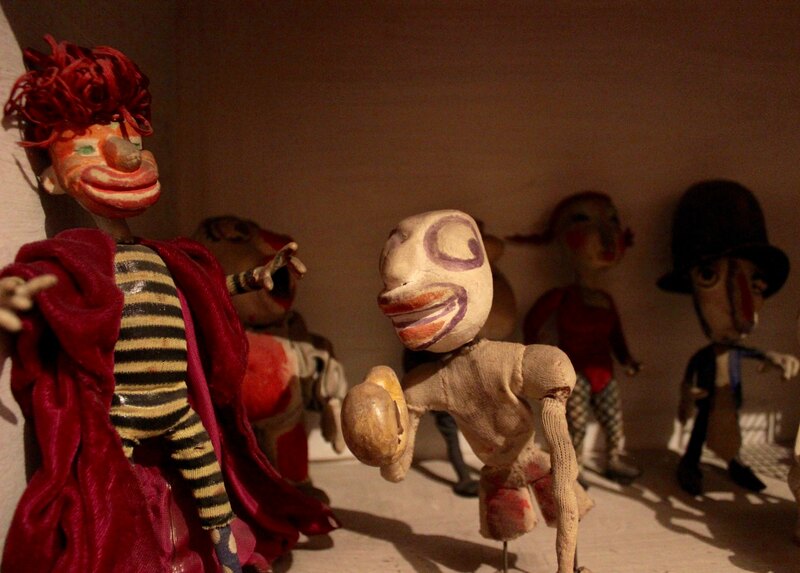 I accessed the archives at the International Institute of Puppetry in Charleville-Mézières, France. Not a mention of Sulakauri. Nothing on Wikipedia. He is listed as Carlo (sic) Sulakauri in IMDb. I guess someone thought he was Italian. There was very little information there. Not even his dates (1924 – 2000). I was more convinced than ever that others, especially animators, need to know who he was. And so this essay along with my photos is a first step to informing the rest of the world about him. There was one final thing that Dato told me that said me everything about his father. 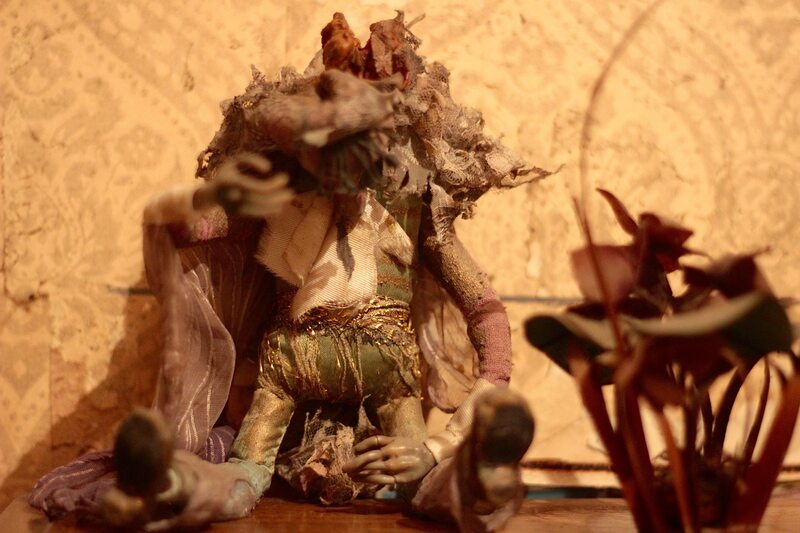 When he was just a six year old boy a traveling puppet troupe had come through his village. Later the family realized that Karlo was missing. Everyone searched the village. Karlo was nowhere to be found. The whole village was worried. Eventually it was discovered that young Karlo had stowed away to join the traveling puppet show. Old man in a wagon. Memories of running away to join the puppet show? And remember we are still funding this project from the bottom of very shallow pockets and can still use all the help we can get. We are grateful for recent PayPal contributions that really meant much more than can be expressed here. If you wish to help out please feel free to make a contribution. You can also share this story with others. Thanks for the continuing encouragement.